We Didn’t Journey To Bethlehem But Paris Seems Pretty Heavenly! We have caroled, spent time with friends, were late to candlelight service, and are having a peaceful day. Here are some thoughts for today. The support and love we have gotten from friends and family has been overwhelming. The love of Jesus has shone through all these precious people who definitely have made room in their hearts for Him and us! People have many firsts in their lives but not everyone has a first Christmas with a new kidney! Our Christmas Eve was calm and bright. Both of our children were here and all of us under one roof – safe, dry, and warm. The Christmas tree lit and the fireplace glowing, food to eat – no huge excitement or loud parties. Just all of us here – at home. O Come All Ye Faithful, Joyful and Triumphant! So many prayers have been answered. We have not done it perfectly (whatever that means) and it has been harder than Dale ever thought. It has been humbling and maybe that was part of the message. We have survived and have a period of healing to go through and adjustments to make but we are so grateful to be here. The kids are playing Guitar Hero in the other room and we are here with them – that is our Christmas present (that and trying to see how many songs I know from the video game). It’s funny sitting here and listening to ZZ Tops’ “La Grange” and FogHats’ “Slowride” in the other room. And we are NOT there – nuff said. I hope that all of our friends and family are having a Merry Christmas and that the love and peace of Christ surrounds you and yours this day. This entry was posted in Faith, health, Kidney, Personal on December 25, 2007 by Dee. Beautiful post! It is a Merry Christmas, isn’t it? Love to all of you from the Kornegays. 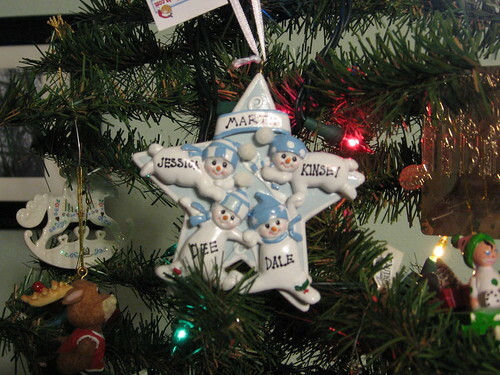 You’re welcome for the ornament – just glad you guys are home and Dale is better! !